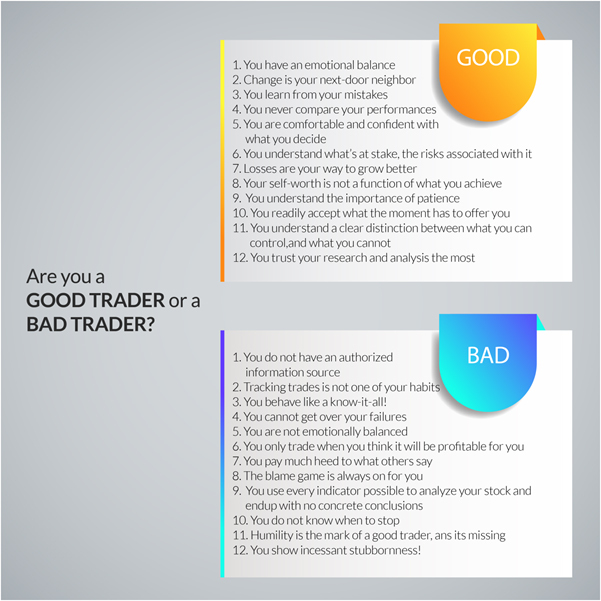 Are you a good trader or a bad trader? Trading is a game of acceptance, patience, wisdom, persistence, discipline, and detachment. While there’s no single tactic of doing this, there some signs that state whether your trading practices are on the right track or not. You are emotionally balanced and you understand how important it is not to let your emotions affect your trading decisions. Change is your next-door neighbor. You do not fear it and are always ready to welcome new strategies openly. You learn from your mistakes. You understand that lingering on a single mistake and playing the blame game will not improve your performance, but learning will. You never compare your performances. Period. You reap compassion, genuine support, and understanding for someone who has had success. You are comfortable and confident with your decisions. Letting others influence you is not a possibility. You understand what’s at stake and the associated risks. Losses help you grow. For you, they are opportunities to move forward and try again. Your self-worth is not a function of what you achieve, but something that is dependent on your healthy state of mind. You understand the importance of patience, and the concept of “No pain, no gain.” You are good with the fact that to attain long-term goals, you have to bear short-term losses. You readily accept what the moment has to offer you without exclaiming that you need more. You are fine with small gains. You see the distinction between what you can control, and what you cannot. What this means is that you understand that you cannot control markets, but can control your behavior. You trust your research and analysis the most. While you are open to hearing what others have to say, you trust your findings to make a decision. Are you a bad trader? You do not have an authorized source from which you derive information. Tracking your trades is not one of your habits. You behave like a know-it-all! You are not open to learning. You cannot get over your failures and have a problem moving on. You are not balanced emotionally. For every fall you see, you start panicking, instead of maintaining your composure. You only trade when you think it will be profitable for you. You pay much heed to what others say. The blame game is always on for you. You use every indicator possible to analyze your stock and end up with no concrete conclusions. You do not know when to stop. Moreover, when the circumstances force you, you start whining. Humility is the mark of a good trader, and that is missing from your attitude. You show incessant stubbornness! You try making profits from trades you have already lost. It is essential for you to self-assess your trading attitude and behavior. While this might not be an exhaustive list, it definitely can help you think about your trading practices.